Nothing contrasts with the form of the world. To continue with the Wittgensteinian theme of yesterday’s guest post from William Lyons (A Play about Wittgenstein), the author of the soon-to-be-produced play about Wittgenstein, The Crooked Roads, I’d like to consider Wittgenstein’s transitional period. Scholars of Wittgenstein distinguish between the early Wittgenstein of the Tractatus Logico-Philosophicus and the later Wittgenstein of the Philosophical Investigations and the ordinary language philosophy that this book spawned. Between these two periods concerned, respectively, with the formal character of language and the informal character of language, Wittgenstein wrote much and published nothing. 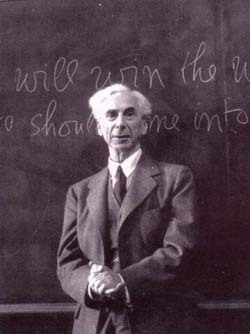 Almost everyone has heard, “Whereof one cannot speak, thereof one must remain silent” (“Wovon man nicht sprechen kann, darüber muß man schweigen”) from the Tractatus, and probably most have heard, “Back to the rough ground!” and, “Nothing is hidden” from the later Wittgenstein (although I note that neither of these examples appear on the Wittgenstein page of Wikiquote). Wittgenstein was no less aphoristic during his transitional period, and his posthumously published works that fell between the Tractatus and the early drafts of the Philosophical Investigations — Philosophical Remarks, Philosophical Grammar — are a rich source of ideas. While Wittgenstein had a program and a method when he wrote the Tractatus and the Philosophical Investigations, during his transitional period he was groping for answers. His former thought had come to seem inadequate to him, and he had not yet arrived at the ordinary language method that he employed in his later period. I find the tentative and exploratory character of the transitional works to be quite congenial. There is one line from the Philosophical Remarks that has haunted me for years, and I don’t think that this has achieved the recognition it deserves. In fact, I have never heard anyone quote, and I have never seen anyone cite, this line: “Nothing contrasts with the form of the world.” I stumbled upon this not long after acquiring my copy of Philosophical Remarks, and I have remembered it and thought about it time and again over the years, much as I continue to think about the line attributed to Valery, too see is to forget the name of the thing one sees. Like much in Wittgenstein it sounds more like a Zen koan than an aphorism of Western philosophy. What is the sound of one hand clapping? What contrasts with the form of the world? This is more a locus of meditation than an answer to a question. Like much that Kierkegaard wrote, this passage has a beautifully poetic quality to it, and even a fairy tale quality to it also. If Hans Christian Anderson had written philosophy it would have sounded like this. After Wittgenstein heroically struggled toward an understanding of simplicity, he ultimately institutionalized that understanding in a new philosophical method that placed a ordinary language describing an ordinary world at the center. Yet I still find some value in the struggle itself, before any answers have been formulated, and for serious thinkers the struggle is never finished. Last August I wrote about the possibly apocryphal quote from Paul Valéry: to see is to forget the name of the thing one sees. I mentioned then that I am fascinated by this quote and often return to it. I found myself thinking about it again recently and find that I have more to say on it. A good aphorism is pregnant with meaning and can always be the point of departure for another meditation, as a text of scripture can always be the point of departure for another sermon. To see is to forget the name of the thing one sees. What is meant by “seeing” in this context? 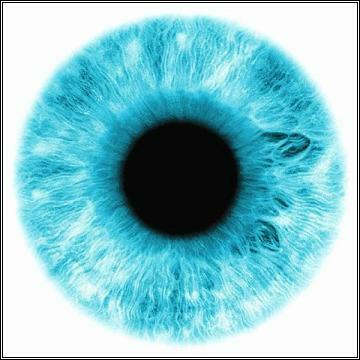 Seeing — true seeing, genuine seeing — is seeing that transcends the ordinary experience of seeing. The ordinary experience of seeing gets lost in conventions. People scarcely notice the things around them. As soon as a thing is seen, it is immediately assigned to some familiar category and no more attention is paid to. In this way, seeing becomes an exercise in identification, and identification draws upon a familiar conceptual scheme, a Weltanschauung in which there is a place for everything and everything is to be found in its place. Such “seeing” is little more than an excuse to dismiss things with a glance, to ignore the world. Wittgenstein here observes an unexpected coincidence of ordinary and extraordinary experience. For Wittgenstein, extraordinary seeing is simply a shift in perspective away from ordinary seeing. And ordinary seeing is not an excuse to ignore the world, as I wrote above, but is an immersion in the world. The Wittgensteinian conception of extraordinary experience is immanent; Wittgenstein rejects the transcendent as a source of the extraordinary. I can imagine someone not getting the point of Wittgenstein’s example; it is more in the nature of a parable than an argument. And like most parables, it is inherently ambiguous. Wittgenstein was, after all, from Vienna: a crucible of modernity in which thoroughly modern ideas were no sooner given their initial formulation than they were dialectically confronted with their opposite number. As I have noted elsewhere, reflexivity is of the essence of modernity. Should we seek the extraordinary variety of seeing invoked in the possibly apocryphal Valéry quote in ordinary experience? Is there a dialectic of ordinary and the extraordinary experience that would reveal seeing as the seeing the forgets itself as seeing? For Wittgenstein, it is a change of one’s point of view that renders the ordinary extraordinary. Presumably, also, there is a change in point of view that would render the extraordinary ordinary. Is there a changed point of view that would give us extraordinary experience from our ordinary experience? Can we find an unexpected coincidence of the two through a shift in perspective? Can a change within oneself make one see as one has not seen before? What is true seeing, genuine seeing? Vision. Thus the seeing with which the quote is concerned is visionary seeing. How does one attain a vision? The ordinary might converge upon the extraordinary through repetition. Repetitive rituals — essentially, iterations of ordinary experience — have long been employed to induce altered states of consciousness, that is to say, extraordinary experience. I wrote about this in Algorithms of Ecstasy. But Valéry would not likely have been sympathetic to this. In his famous essay, “Man and the Sea Shell,” Valéry wrote, “…it is the nature of the intelligence to do away with the infinite and to abolish repetitions.” It is perhaps unreasonable to take this line from Valéry out of context, for it is a line that means something in its context. But it is not entirely unreasonable. Elsewhere Valéry makes explicit criticisms of Cantorianism and the Cantorian conception of the infinite, and the simplest way to the infinite is the endless iteration of anything. There is also, in Valéry, an implicit criticism of the extraordinary, and this criticism could well be of a piece with his rejection of Cantor. If the quote that concerns us is indeed from Valéry, it is not a paean to outlandishness for the sake of outlandishness. For Valéry, Cantor is too outlandish. For Valéry, even extraordinary vision would be ordinary in a sense, finite to be sure, not the excrescence of an altered state of mind. And thus we find ourselves back at the coincidence and convertibility of ordinary and extraordinary experience, of mundane seeing and visionary seeing. In the difference between the approaches to the extraordinary by way of the transcendent or the immanent, Valéry and Wittgenstein represent the immanent. Cantor perhaps represents the transcendent, though he had little to say regarding experience, whether ordinary or extraordinary. But perhaps a theory of extraordinary experience, hence visionary seeing, might be derived from Cantor, and, once derived, placed in transcendental contrast to the immanence of Valéry and Wittgenstein. Martin Schongauer’s treatment of the Ecce Homo theme — Behold the man! I once had the good fortune to see an exhibition of Schongauer’s graphic works, when I visited the famous Unter den linden Museum in Colmar, France, where I had made an aesthetic pilgrimage to see the Issenheim Altar. A couple of days ago in What it Means to Behold I suggested that the relationship of beholding belongs to a unique epistemic category. I didn’t think of it at the time (though it seems obvious now), but the quote attributed to Paul Valéry that I have discussed on several occasions — to see is to forget the name of the thing one sees — could be said to exemplify at least one aspect of beholding. There is, in the Valéry quote, a recognition of a mode of both perception and of cognition that has become removed from the familiar order of things. The suspension of familiar linguistic conventions and categories implied by the quote is part of this (and this is what the Russian formalists called “defamiliarization”). But beholding goes father than this. One could say that to behold is to forget the name of thing one beholds, and also to forget oneself and to forget the world entire. In the attitude of beholding there is the object that is beheld and nothing else, nothing more. 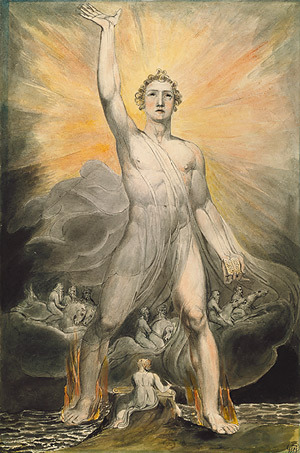 William Blake's 'Angel of Revelation' is a fitting figure of the inspirations of genius. Thinking again of what I wrote few days ago in The Mind’s Singular Function, I realized that I should have said that, while the product of inspiration could be considered a memorialization of the singular, it is important to note that it is in no sense an attempt to reproduce, recreate, simulate, or imitate the singular episode of inspiration. In so far as a work of creative expression is a memorialization of the singular, it is an oblique memorialization, and mimesis plays no part in it. This follows from the fact I previously noted that inspiration is not identical to the products derived from inspiration. This makes of the intellectual singular a haeccietas more absolute than any chance event in the mundane world, which latter may have representational memorializations. Inspiration is not a representational memorialization. I realize that my formulations are as yet highly imperfect, but I have at least the idea (more or less), which I can attempt to refine and to apply. One application is the possibility of defining genius, which is usually treated as an ineffable quality of mind. But in view of the character of inspiration as the singular in the sphere of the intellect, genius can be defined as the continual, or near-continual, immersion in the singular. This reminds me of a remark attributed to Blake’s wife, which I may have quoted previously (it is one of my favorite quotes): “I have little of Mr. Blake’s company — he is always in paradise.” This puts the matter succinctly, not to mention personalizing it. This latter formulation — i.e., genius as the immersion in the singular — begs the question of immersion. I think that degrees of immersion need to be recognized, but that absolute immersion can be given a relatively simple formulation: it is when the mind is so concentrated on a single focus that the remainder of the world is relegated to the periphery. I call this the “undivided mind”. It is a rare but not unknown state of mind. Another formulation is suggested by the extrapolation that I made of the quote attributed to Paul Valéry, namely, to see is to forget the name of of the thing one sees. The idea implicit here can ultimately be pushed beyond the senses to the transcendence of thought itself: to think is to forget the name of the thing one thinks. The two instances I cited in Interests and Identity, Camus saying near the end of his life that his work had not yet begun and Cézanne also near the end of his life saying that he is making slow progress, are perfect examples of genius utterly immersed in the object of its fascination. Kenneth Clark, in discussing Mozart, mentioned the “single-mindedness of genius.” This is of a piece with these fragments from the life of Camus and Cézanne. So let us, then, upon the occasion of a time of Confession speak about this sentence: PURITY OF HEART IS TO WILL ONE THING as we base our meditation on the Apostle James’ words in his Epistle, Chapter 4, verse 8: “Draw nigh to God and he will draw nigh to you. Cleanse your hands, ye sinners; and purify your hearts ye double-minded.” For only the pure in heart can see God, and therefore, draw nigh to Him; and only by God’s drawing nigh to them can they maintain this purity. And he who in truth wills only one thing can will only the Good, and he who only wills one thing when he wills the Good can only will the Good in truth. Let us speak of this, but let us first put out of our minds the occasion of the office of Confession in order to come to an agreement on an understanding of this verse, and on what the apostolic word of admonition “purify your hearts ye double-minded” is condemning, namely, double-mindedness. Then at the close of the talk we may return more specifically to a treatment of the occasion. What I have above called the undivided mind is here seen as the condition of having transcended double-mindedness — as much a concern for a theologian like Kierkegaard as for a thorough-going naturalist. This famous proposition of Kierkegaard can be given a reformulation much as I reformulated the famous line from Valéry, and Kierkegaard thus extrapolated would run like this: Purity of mind is to think one thing. The single-mindedness of genius, the immersion of the mind in its object, is the purity of mind that comes from thinking one thing.